Hampton V-2-10 10 Pair Vertical Cradle Dumbbell Rack - The Hampton V-2-10 is a 10-pair compact vertical dumbbell rack with two opposing sides of cradles for easy access to chrome beauty grip, cast iron hex dumbbells, rubber hex dumbbells, and urethane hex dumbbells from 2.5 lbs up to 35 lbs in size. Unlike a long horizontal dumbbell rack, a vertical dumbbell rack has a very compact footprint and is ideal for smaller workout spaces. With a footprint of only 18" wide by 8" deep, the V-2-10 can be placed almost anywhere with limited obstruction to foot traffic or other equipment in the space. This rack is stylish and well balanced with a heavy-duty frame fabricated from 12-gauge steel for added strength and stability. Easy access cradles make removing or re-racking any size and weight dumbbells easy from any level. And each cradle includes a protective nylon liner to prevent scratches to dumbbell handles. If you're looking for a large capacity vertical dumbbell rack with two sides, the V-2-10 is the largest in the Hampton Fitness line-up. Dumbbells as shown in manufacturer stock photo are for demonstration purposes only and are NOT included. Double-sided vertical racking designed to hold 10 pairs of compact dumbbells. 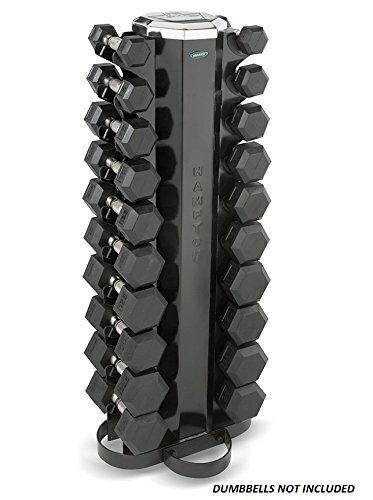 Holds compact chrome beauty grip, cast iron hex, rubber hex, urethane hex dumbbells from 2.5 to 35 lbs. in size. Heavy 12-gauge steel construction. Black gloss finish. Cradle width 4.5". Cradles lined with heavy nylon to protect dumbbell handle finish. Dimensions: 20" W x 22" D x 48" H. Weight 50 lbs. Dumbbells NOT included.